PIQUA — A man was arrested over the weekend after reportedly assaulting a woman and restraining her against her will on Saturday. 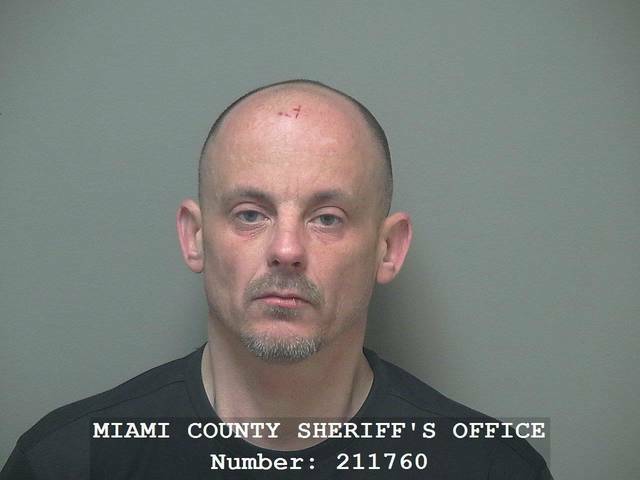 Jason E. Slaybaugh, 45 — who has previous addresses in Troy and Westfield Center but was living in a tent off of Cromes Drive in Piqua at the time of this incident — was charged with second-degree felonious assault and third-degree felony abduction in connection with this incident. The incident was reported on Saturday at approximately 4:35 a.m. in Piqua. The victim was known to Slaybaugh. He reportedly assaulted her after she returned to check on him in his tent on Cromes Drive near Patrizio Place, according to Piqua Police Department reports. Slaybaugh reportedly kicked and punched the victim. Slaybaugh then allegedly restrained her to prevent her from leaving after she attempted to flee, according to police reports. After a couple hours, she convinced Slaybaugh to let her go. A responding officer noted that the victim had a significant injury to her head and also that her hair was matted with blood at the time she was able to get away and call for help. Slaybaugh was arrested on Saturday and booked into the Miami County Jail at approximately 6:30 a.m. that day. Slaybaugh was also charged with first-degree misdemeanor domestic violence in connection with this incident. Slaybaugh was arraigned on those charges in Miami County Municipal Court on Monday. He is continuing to be held in the Miami County Jail on a total bond of $15,000. A preliminary hearing for Slaybaugh is scheduled for this week.